On Qualifying Carrier ® Systems with approved credit. Reliable Air Conditioner Repair, Heating Maintenance and Furnace Repair as well as Fuel Delivery Services in Bath, PA & Surrounding Cities Since 1992! Sullivan Oil & Propane is more than just a fuel delivery service. We are full-service heating and air conditioning specialists. Our professional staff is available to repair your HVAC system, install or replace your heating and cooling equipment and deliver fuel for your furnace and major appliances. To better serve customers in Allentown, Bath, Bethlehem, Easton and east central Pennsylvania, we offer top-quality products and customized services that are backed by decades of experience. We’re available to provide these comprehensive services when you need them. Replacing an air conditioner or heater is an eventuality that every homeowner will face. You can make the most of it by installing an energy-efficient replacement. If your current system costs too much to run, can’t be repaired or isn’t keeping your home comfortable, a new air conditioner is an investment that can save you money. You deserve the best. Give us a call, and we will impress you with our quality products, unmatched service, affordable prices and professional staff. If you need another reason to choose us, here are a few. We have been in the fuel business for more than 100 years. We have more than two decades of experience in the HVAC industry. We offer 24-hour repairs and emergency fuel delivery. 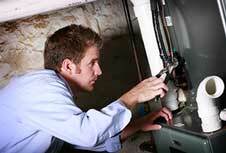 We employ NATE certified technicians. We are a state licensed HVAC contractor. We serve the entire Lehigh Valley and portions of the Poconos. You can count on us for all of your fuel delivery needs. We’re pleased to provide propane and conventional heating oil to customers throughout the region. We’ve delivered clean, high-quality fuel at competitive prices for more than a century. For added convenience, we can provide automatic delivery on a customized schedule to ensure that you’ll never run out of fuel or have to worry about measuring your tank again. To purchase heating oil or LP gas for your fireplace, dryer or major appliances, we’re the company to call.